Mulch and fertilizer lead to great gardens. Artificial mulch manufacturers claim it's safe to use in the garden, but many gardeners have concerns about adding it to the soil. Although rubber mulch and glass mulch offer benefits, there are drawbacks too. Artificial mulch includes mulch made from rubber, glass and other manufactured materials. Rubber mulch typically comes from used car and truck tires that are treated, shredded, and packaged into mulch. Glass mulch consists of recycled glass that is tumbled to remove sharp edges. There are pros and cons to using artificial mulch of any type. Among artificial mulch types, rubber mulch generates the most controversy. 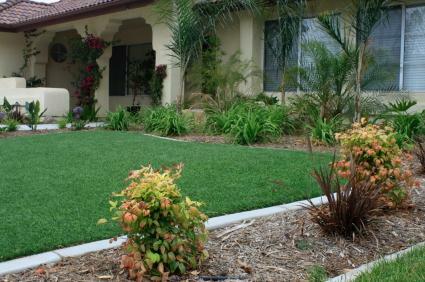 There are many benefits, as well as drawbacks, to consider before investing in rubber mulch. Advantages: Rubber mulch manufacturers like to promote their product as a safe, environmentally friendly product. Using recycled tires in new and innovative ways certainly keeps them out of landfills, where they create both an environmental hazard and a fire hazard. Manufacturers claim that the mulch is perfectly safe because the rubber is treated before making it into mulch to reduce or remove harmful elements such as zinc, cadmium and nickel that are often found in automobile tires. Another benefit of rubber mulch is that it suppresses weeds very well. Unlike natural wood chips, weed seeds cannot take hold among rubber mulch chips. Rubber mulch lasts for decades, and although the color may fade, the chips won't degrade into the soil the way wood chips do. Lastly, rubber mulch offers a safer surface for playgrounds than concrete or pavement, reducing injuries and skinned knees. Disadvantages: By far the biggest concern about rubber mulch is its environmental impact, an ironic fact considering that manufactures tout it as an environmentally friendly product. Rufus Chaney, part of the U.S. Department of Agriculture's composting team (yes, there really is such a thing) since 1973, states that tires contain zinc and that zinc remains in the product even after being made into mulch. Excessive zinc almost certainly kills plants. If the plants survive this excess zinc and are vegetable or fruit plants, eating the produce isn't healthy since it introduces zinc and heavy metals into people through consumption of the plant itself. Chaney advises against using rubber mulch because of the evidence he's collected and observed over the years demonstrating that rubber mulch puts too many harmful metals into the soil and kills or suppresses plant growth. Like rubber mulch, other artificial mulch has benefits and drawbacks. Glass mulch offers much but isn't right for every situation. Advantages: Glass mulch is another artificial mulch made from recycled materials. Glass chips are tumbled so that they're smooth, then packaged for sale. You won't cut yourself on glass mulch and you and your pets can walk over it without harm. It creates a sparkly beauty in the garden and aids in weed suppression. Disadvantages: Glass mulch should not be used near plants that need high moisture. In fact, it actually creates a drier environment, which is the opposite of what mulch is traditionally used for. Most mulches, including rubber mulch, prevent water loss from the soil through evaporation and are supposed to help the soil retain moisture. Glass mulch, on the other hand, does not do this. It is useful in areas where a rock garden effect is desired, but don't use it around plants that thrive on moisture. Like many artificial mulches, it does not break down, which also means it doesn't add anything into the soil. After learning about some of the potential dangers of rubber mulch, many gardeners swear they'll never use it. Check the label on bags of potting mix, bulk soil or so-called natural compost and beware of anything listed as simply 'filler material.' Currently in the United States, there's no law requiring manufactures to specifically list rubber mulch as an ingredient in any gardening product, and many do use it to add bulk and aerate potting mixes more cheaply than traditional contents such as vermiculite. When in doubt, you should be able to call the company and ask directly if the product contains rubber. Rubber mulch may be useful in playgrounds, horse riding arenas and horse racing tracks to reduce injury of both people and animals. However, if you're concerned about the impact of artificial mulch on your garden and plants, consider the many natural alternatives available to you, such as wood chips, shredded bark, and cocoa hull mulch. While many consider artificial mulch safe, if you're looking for a product that's environmentally friendly, wood chips or bark may be your best bet.